A large number of structures in coastal regions or crossing waterways are supported on piles. These piles are commonly made of concrete or wood. Additionally, steel piles are often encountered in certain structures, such as offshore oil platforms. 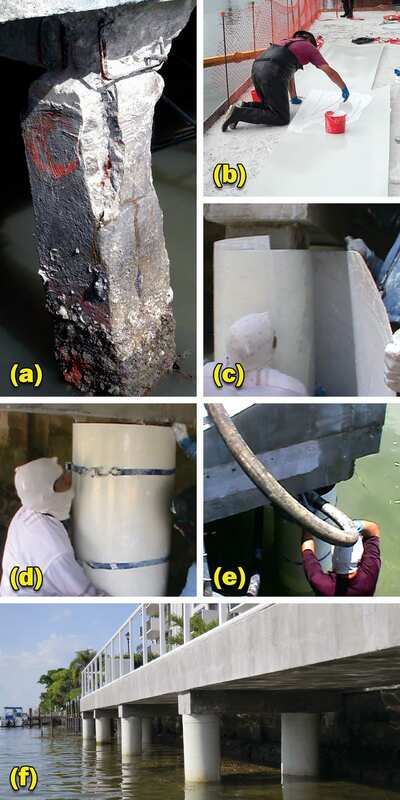 The adverse environment introduced by seawater, high humidity/high temperature, and dry-wet cycles causes rapid deterioration of these structures. The most severe conditions are found in the splash zone area, which encompasses the portion of the pile between the low- and high-tide water levels. The high concentration of chlorides in seawater allows it to penetrate and reach the steel, even in high-quality concrete. As a result, the passive layer that normally protects steel is destroyed, making the corrosion of reinforcing or prestressing steel inevitable. Because corroded steel occupies a larger volume, it causes lateral forces on the surrounding concrete that far exceed the tensile strength of concrete. This results in cracking and spalling of the cover concrete. The deterioration of concrete and the loss of the cross-sectional area of the reinforcing steel results in a reduction in the capacity of the piles. Repairs often require creating a formwork around the pile and filling it with grout or concrete to enlarge the section, thereby increasing its load carrying capacity. The wet marine environment, combined with access difficulties, are not suitable for the use of formwork made with wood or steel. In the last 20 years, glass fiber-reinforced polymer (GFRP) jackets have become a material of choice for formwork in marine construction. GFRP jackets are lightweight and moisture-tolerant and have been used extensively for underwater pile repair. These products are typically constructed of two half shells made out of fiberglass that are bolted or glued together or held together with external straps to form a jacket around the pile. In some cases, the connection may be a tongue-and-groove type that gets filled with epoxy in the field. There are also other forms where the two half shells are supplied as U-shapes, where the sides are overlapped and bonded together in the field with epoxy or screws to create a solid rectangular or square shell. Some of the jackets commonly used to date are shown in Fig. 1. In some cases, these forms are used as stay-in-place forms. 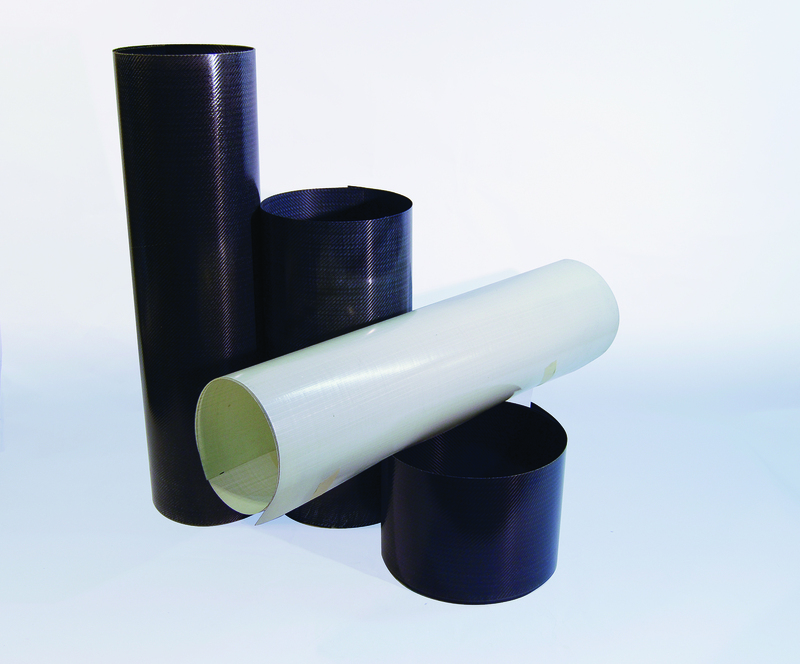 The repair and strengthening of structures by external bonding of FRP products was introduced in the late 1980s. The technique, known as wet layup, includes saturating fabrics of carbon or glass with resin in the field and applying them to the surface of beams, columns, walls, slabs, and pipes. By the next day, when the FRP is cured, it forms an impervious sheet that is two to three times stronger than steel. This technique has seen worldwide acceptance and growth in the last two decades for the repair of buildings and bridges. The repair of piles with the wet lay-up technology is not very efficient. Among the major disadvantages is the fact that wet layup fabric can be applied to smooth surfaces only. For deteriorated underwater piles, the forming of the surfaces requires construction of coffer dams, adding significant expense to the project. It is therefore preferred to use FRP forms, which create a shell around the deteriorated pile, allowing the annular space to be filled with grout and thereby eliminating much of the surface preparation. In a patent-pending process developed by the author, sheets of glass or carbon fabric are impregnated with resin in the manufacturing plant and pressed together under high pressure and heat to produce very thin laminates. PileMedicTM laminates are manufactured in thicknesses ranging between 0.010 to 0.025 in. (0.25 to 0.64 mm). Depending on the design requirements, the laminate may include multiple layers of uniaxial or biaxial carbon and glass fabrics. Typical laminate rolls are less than 0.025 in. (0.64 mm) thick by 4 ft. (1.2 m) wide by 300 ft. (91.4 m) long (Fig. 2). The manufacturing process allows for the production of laminates with a tensile strength higher than 150,000 psi (1035 MPa). By mixing and orienting the fibers in different directions, laminates with an infinite number of strength and stiffness characteristics can be produced. As shown in Fig. 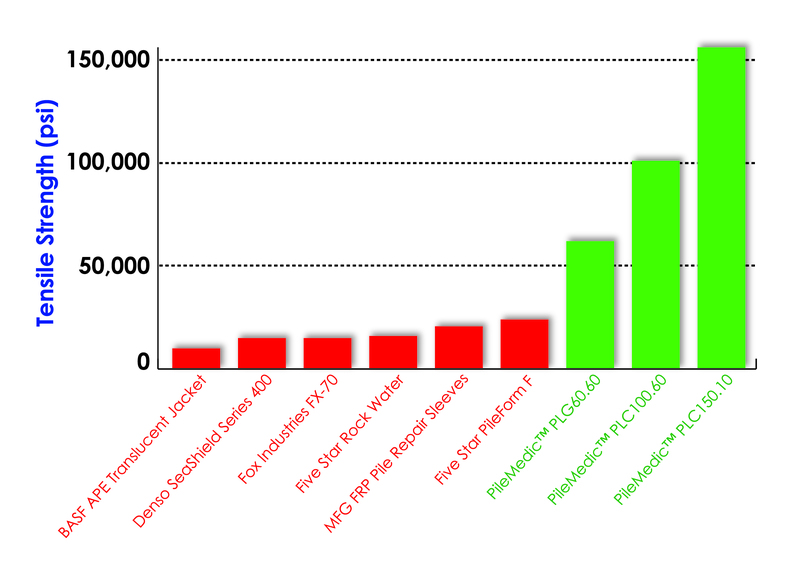 3, the strength of PileMedicTM laminates is significantly higher than all other pile jackets in the market. In the field, the laminates are cut to the desired size and wrapped around the pile to create a multi-layered shell of any desired size. The annular space between the shell and the pile is filled with grout or resin. A moisture-insensitive resin that cures in water is applied to the laminate as it is wrapped onto itself to create this free-standing shell. This process eliminates the need for construction of costly coffer dams. The first application of PileMedicTM laminates for the repair of underwater piles was recently completed at Guilford House Condominiums, Bay Harbor Islands, FL (Fig. 4). The project is located on the environmentally sensitive South Florida intra-coastal waterway. Approval from the Florida Department of Environmental Protection (DEP) was required prior to restoration. The 14 x 14 in. (356 x 356 mm) piles (Fig. 5(a)) had substantial steel corrosion and spalled concrete. While searching for a repair methodology, the contractor recommended using the new PileMedicTM laminates for the piles that supported an overlook on the pool deck, for ease of installation and the added structural enhancement. The laminates were packaged in 4 ft. (1.2 m) wide x 300 ft. (91.4 m) long rolls. The manufacturer’s specification requires a minimum double-layer wrap plus an 8 in. (203 mm) overlap beyond the starting point. This reduces the inter-laminar shear stresses between the two plies of FRP and ensures that the pile is confined by the same high confining pressure all around—that is, 360 degrees. The PileMedicTM system leaves no plane of weakness along the height of the jacket. For this application, it was decided to encase the piles in 21 in. (533 mm) diameter cylindrical shells; this was a tightly fitting circle that would leave a small gap (about 1/2 in. [13 mm]) between the jacket and the pile at the four corners of the piles. The circumference of such a shell is 66 in. (1680 mm). Thus, the laminates were cut into 66+66+8 = 140 in. (3560 mm) long pieces. This allowed for creating a two-ply cylindrical shell with a diameter of approximately 21 in. (533 mm) plus an 8 in. (203 mm) overlap at the end. The two-component epoxy that is provided as a part of the PileMedicTM system is environmentally safe and complies with the highly stringent requirements for lining potable water pipes. The epoxy is also moisture-insensitive and it cures underwater, eliminating the need for any coffer dams. The epoxy was mixed using a jiffy mixer and applied with a thickness of 40 mil (0.04 in. [1 mm]) to the 66+8 = 74 in. (1880 mm) length of the laminate; the first 66 in. (1680 mm) length of the laminate that will be placed next to the pile does not need to be coated with epoxy (Fig. 5(b)). Because the water was relatively shallow, the workers could pick up the laminate and walk it in water. At this time, the laminate is wrapped around the pile to create the 21 in. (533 mm) diameter shell (Fig. 5(c)). At this stage, the uncured epoxy coating serves as a lubricant, allowing the laminate to slide easily as the crew makes final adjustments to the diameter of the shell. Ratchet straps were used to fix the diameter of the shell and prevent it from unraveling before the epoxy cures (Fig. 5(d)). The cylindrical shell can be moved vertically along the height of the pile to its final position. In this case, it was pushed down into the mud that created a seal at the base. An underwater grout was mixed and pumped with a hose into the annular space between the jacket and the pile (Fig. 5(e)). As the tremie mixture was placed, it displaced the water in the annular space to the top until the entire annular space was filled with grout. At this stage, the hydrostatic pressure of the grout pushes the two layers of the FRP jacket tightly against one another while the ratchet straps prevent the jacket from opening up. At the same time, the heat generated from the hydration process of the grout helps with the curing of the epoxy. Depending on the ambient temperature, the epoxy will cure in several hours, at which time the ratchet straps can be removed. The repaired piles at the conclusion of the project are shown in Fig. 5(f). In the repair of underwater piles, it is common to schedule the work around low-tide hours and working continuous eight-hour shifts may not be efficient. Nevertheless, on this project, the repair of 14 piles was completed in four working days (ahead of schedule) using a small crew.